Why are there so many different views of end-time Bible prophecy? Don McGee: First of all, I would like to address this term "Pan-Millennialist." I do hear that term from time to time, usually a lot from pastors. It's usually intended to evoke a chuckle or a laugh. I don't see it that way. If someone is really a Pan-Millennialist, it indicates to me they are not willing to study. How can you study Bible prophecy from Genesis all the way to Revelation and not have an opinion? If you read the Bible literally, then you are going to come out with what I believe to be a Pre-Millennial, Pre-Tribulation opinion about end time events. I don't see any other option. Dr. Reagan: I used to have a colleague named Dennis Pollock. He used to get so aggravated at pastors who were saying, "Well, I'm just a Pan-Millennialist." He would say about them, "Those people would have been really good members of the Know-Nothing Party back before the Civil War, because they just are admitting that they know nothing about Bible prophecy and don't care to know a thing about it. Don McGee: Anybody with money invested in the stock market does not take a "pan-stock market" attitude, so why would they take it with Scripture? Nathan Jones: Pan-Millennialists that I've run into look at Bible prophecy and say that those of us who get into the subject must just sit on our suitcases twiddling our thumbs while waiting for Jesus to come back. They believe we are no good to anybody. But, that is not the case. Bible prophecy makes us motivated to preach the Word. Don McGee: It certainly does! I believe that one of the reasons we have so many bad attitudes about the study of end times is because people want to hear what they want to hear. If you don't want to hear about the imminent return of Jesus, then you are going to take the attitude that well the Lord says a year is like a thousand and a thousand years is like a day to Him, that kind of thing. That clearly was not a hermeneutical principle that He was establishing there. Dr. Reagan: Don, isn't also rooted in whether or not you approach the Scriptures for their plain sense meaning or whether you tend to spiritualize them? Don McGee: Why would we spiritualize Scripture? If you spiritualize Scripture you can make it mean anything you want it to mean. That makes you God. It also stabs the conscience. I wouldn't have to really worry about what the Bible truly says because I would see it as meaning something else. We don't spiritualize directions to putting furniture together, do we? If you are learning to fly an airplane and that guy gives you a check-list, you don't spiritualize that do you? Dr. Reagan: That's a good point! When I was growing up in church the only message that I ever heard concerning Bible prophecy was this, "There is not one verse in the Bible that even implies Jesus will ever put His feet on this earth again." Well, when I was about 12 years old, I discovered Zechariah 14 which said Jesus was coming back to the Mount of Olives. I took that passage to my preacher and asked what it meant. I will never forget how he read it and read it. I don't think he ever read it before. When he finally looked up he said, "Son, I want to tell you something. I don't know what it means, but it doesn't mean what it says." What he meant was that the verse couldn't mean Jesus was coming back to the Mount of Olives because it disagreed with his understanding of end time events. Don McGee: What else do you need to say? That betrays the true attitude of the Pan-Millennialist. If someone is seeking the truth, and as Christians we need to do that, then we are not going to take that attitude. We are going to read Zechariah 14 and look at other texts that are similar to it and are going to arrive at a Bible-based conclusion. People will say, "Bible prophecy is apocalyptic, therefore it never means what it says." That sounds almost like a disease, right? No, "apocalyptic" is an excuse term. That's a buzz word that is used almost like the "Pan-Millennial" buzz word. The idea is that if I say something is apocalyptic then God is going to relieve me of any responsibility of studying this and arriving at a conclusion that is definitive according to Scripture. It takes me off the hook. Dr. Reagan: The interesting thing about the book of Zechariah is that it is an apocalyptic book, yet every prophecy in it about the First Coming meant exactly what it said. Don McGee: I have a problem sometimes with people who look at Bible prophecy all spiritualized. For instance, if you go to the book of Micah you will find that they spiritualize a text having to do with the Lord's coming, but when another passage talks about the First Coming of Jesus they will declare, "That is absolutely accurate, that is literal." Well, my question is, "Where do you draw the line? Show me the chapter and verse where you draw the line from spiritual to literal." It can't be done. Dr. Reagan: That's right! When you start spiritualizing, brother, you get into trouble. The two parts of the Bible that are spiritualized the most are the beginning and the end. Spiritualizers will claim the Creation wasn't really six days, but that it was really 600 million years for each day, or whatever. Then, they get to the end concerning the Millennial Kingdom and say it doesn't really mean it's a thousand years long. Those are the two parts that are most abused by spiritualization in saying scripture doesn't mean what it says. 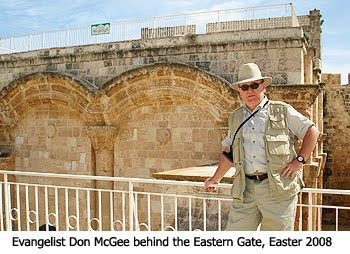 Don McGee: I believe without question Satan is behind this spiritualization of Genesis and Revelation, because it lures people into a false sense of security about origins and also it lures them into a false sense of security about the return of the Lord. And, if you are going to say that God doesn't mean what He says then how do I know He means what He says about the Resurrection of the Saints or about salvation? We might as well just take these truths and trash them. If the Lord didn't mean what He said about taking us out of this world at the Rapture, then what else did the Lord say that I can doubt? Is the Lord really going to take us to Heaven, or am I going to just go into oblivion like the nihilist say. Or, will I spend eternity in Hell? In the last part of our discussion with Don McGee concerning the end times, we'll ask him what the Amillennialists believe concerning the thousand year reign of Christ.